For this year, in a change from the last time I fished it, the Spring League was going to be split into three sections over two venues, Perry St and Sadborow (a pond I hadn’t fished for a long time) with two sections on the former. In another first (for me), we met at Wetherspoons for breakfast and very nice it was too and really good value at only £4.40 with coffee. Then it was out the pond for the draw but not before Les emptied my wallet after paying for my new licence (£25), league entry (£20), pools (£25) and bait (£3), then for good measure Janders turned up and I owed him £28 for some bits and bobs he got from Tackleuk. I would be on the high numbers at Perry St today and Les had appointed section commanders and deputies for each of the three sections and Mike Smith was the man in charge of the draw bucket and the scales for our section while the Tart would assist (or hinder) him. Along with those two, there was Exeter Mike, Mark, Bushy, Hoff, and Picky in my section, originally the lovely Steve Chant from Norton Sub Normal was in our section as well but he got relegated to section B. I pulled out peg 13 which I was fairly happy with and for company I had Exeter Mike on 12 with Bushy on 14, the Tart had managed to draw yet another corner peg (20) although to be fair it’s probably the worst of the four. Janders was in the other section and had drawn the corner opposite the Tart so two of my side bets were on corner pegs and Picky was on peg 17, which isn’t the best but he did have an empty peg next door and this could get expensive and clean out what little loose change I had left! In another moment of madness I asked Exeter Mike if he wanted a pound as well! I set up the usual inline dibber to fish shallow along with a 0.4 gram Drennan Carp for the five metre meat line and a rig for the left hand margin. 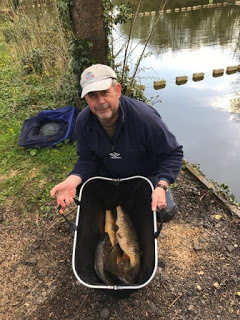 On the side tray I had 6mm Bait-Tech Carp and Coarse pellets and 6mm meat that I boosted with a couple of squirts of Liquid Plum. Section leader Mike got us underway at 10:30 and I fed the five metre line with some meat and the margin with meat and pellets before starting at 11.5 metres with a banded pellet on the shallow rig. Bushy hooked a carp straight away only for it to come off at the net and Exeter Mike had a decent fish from his inside line and I thought we might be in for a good day. 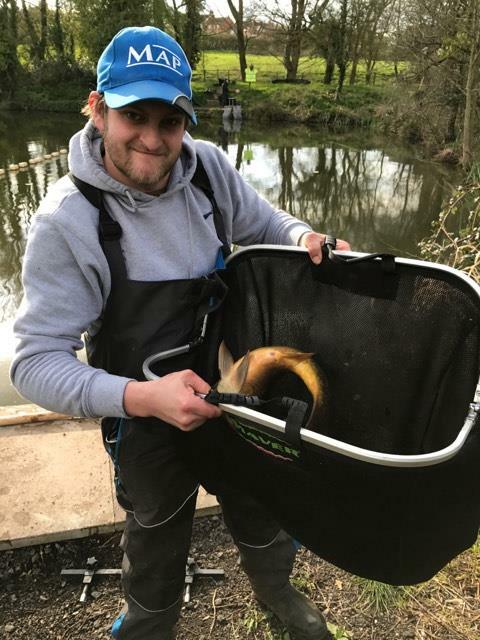 I was pinging in a few pellets and lifting and dropping the rig but it took over half an hour to get an indication and I landed a small carp but that was the only action in the first sixty minutes. Mike had a couple more but from what I could see Mark in peg 11 was struggling as were Howard in 10, Rich in 8, Dunner in 7 and Shane in 6 (although they were in the other section). 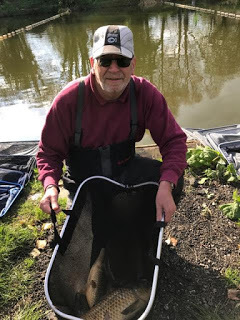 By the end of the second hour I had already tried my other two lines without any more bites, Bushy was still blanking and Mike hadn’t added to his three so my earlier optimism was rather misplaced! Loads of carp could be seen swimming about and I had the odd go at stalking/mugging for them but they didn’t want to know but then out of the blue I had two in quick succession to close in on Mike although I thought he was still ahead as he had bigger fish. Then Bushy finally got off the mark, Mike added another and Mark had one. 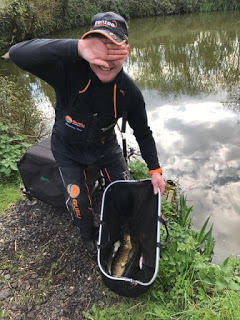 Howard was now getting odd fish and doing well and Shane was catching in peg 6 although it did look suspiciously like he was doing some stalking of his own! Dunner was getting some small skimmers and Rich had one carp. I was only getting the odd fish but managing to stay one or two in front of Bushy although I just couldn’t get level with Mike, he was catching his fish on the inside although he did mug one (shame on you!) whereas I never had a bite on either my five metre line or in the margin. I did lose a fish when the hook pulled out for no apparent reason and I knew on a tough day like today, it could be costly. With an hour or so to go, Bushy drew level with me on six fish before going ahead and it was nip and tuck between us. Despite there being loads of fish swimming about, nine times out of ten they would ignore a pellet in their flightpath and maybe they had other things on their minds! I drew level with Bushy again and then went one ahead but he drew level and it finished with us both on eight fish. Of course he said he only had small fish! Mike ended up with nine fish and he had some lumps so I thought he’d probably win the section. 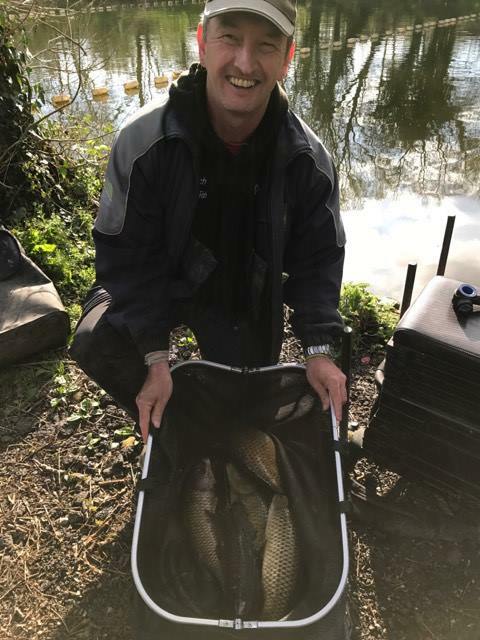 Mark ended up with six carp along with a skimmer and an eel and Picky walked up and said he had six decent fish so it was all going to be very tight. I took my kit back to the car and it had been hard with Mike, Hoff and the Tart all admitting to three carp although as he can’t lie straight in bed I would wait and see what the scales said before celebrating. Squadron leader Mike and his demented deputy started the weigh in at peg 11 and Mark had six lumps to weigh 32lb 8oz and I knew I didn’t have that, Mike then plonked 38lb on the scales to go into the lead. I was next and my fish went 28lb and then Bushy had 32lb 10oz so it had been tight with just one fish between Mark, me and Bushy. Wing Commander Smith had 13lb 9oz and then things got worse for me as Picky had 29lb 13oz to push me down another place and I was £2 down in side bets. The Hoff had 14lb 1oz which just left the Tart and when he weighed 10lb 4oz to finish last in the section and paid me a pound, he helped to turn my frown upside down, thanks Tart! The Tart hits rock bottom! 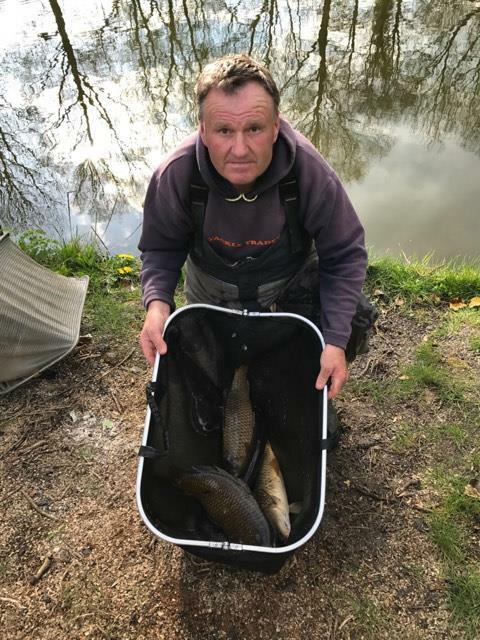 Shane won the other section with 41lb 10oz from peg 6 and Howard took second spot with 28lb 9oz from peg 10. 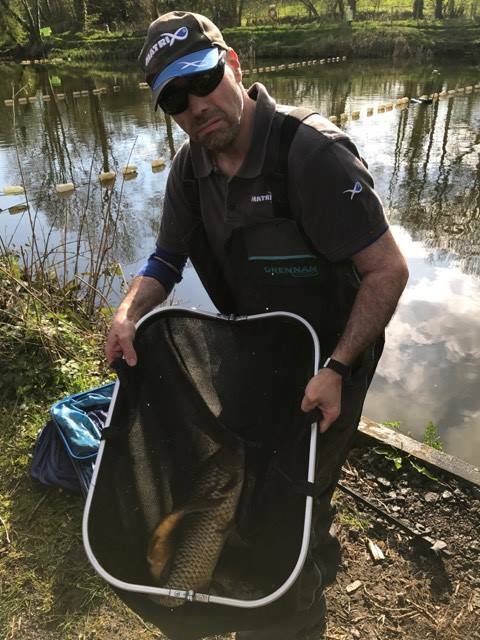 Janders had 16lb 6oz from peg 1 so I ended up 2-2 in the side bets. 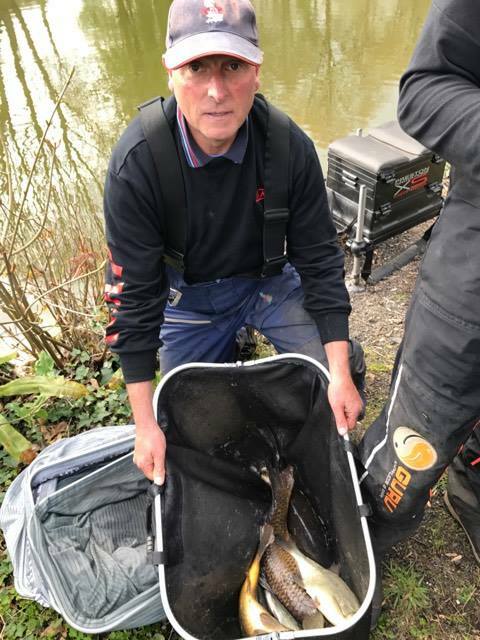 When the others arrived back from Sadborow, as predicted they took the top three places with Les coming out on top from peg 5 with 115lb 2oz, followed by Bish with 99lb and Chanter with 78lb 2oz. So some great weights and it looks like Sadborow is the place to be at the moment although it’ll probably all change by the time I get out there! I noticed three of the four Torquay lads picked money up, who let the side down I wonder?! !